I’ll be upgrading my regular old lead acid battery for a Shorai Lithium Iron Phospate (LFE) battery. Major benefits are its lighter weight and longer life. The Shorai weighs 0.70 kgs (1.54 lbs) compared to my usual Yuasa YTX9-BS that weighs 2.88 kgs (6.35 lbs). 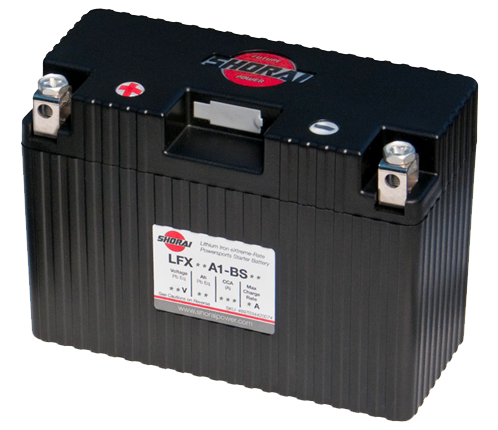 Unlike a lead acid battery, a LFE battery wont lose its charge if the bike is not run for a long time. This is a relatively new technology, but it’s going to be the way of the future. LFE is not the same as your standard Lithium-Ion battery in consumer products, which is Lithium Cobalt Oxide. They are both in the Lithium-Ion family, but LFE uses iron instead of cobalt, which is safer for the environment. Plus, the nature of LFE means that they can’t explode like those incidences with laptop batteries. Since their batteries are so light, Shorai is going to send me a spare, just in case I drain one with all my electronic add-ons.